Schools all over Horry County and pushing technology into new learning environments and the results are amazing. The iPad is changing the way teachers interact with content and their students. Transforming a four-walled classroom into a virtual hands-on learning environment, the iPad is becoming a fantastic tool of interaction and retention for today's students. Students in K-12 and through higher education are benefiting from their direct experience with the iPad. Digitel staffer, Andre Pope, heads up the Mobile Web Technology Initiative at Horry-Georgetown Technical College. Through the past year and a half, HGTC has been looking into the effectiveness of the use of iPads in the classroom. During that time, Pope describes the experience as an eye-opener. Seeing the wealth of knowledge pour in from students entering in from our high schools is an amazing sight. We (HGTC) want to make sure that we foster a learning environment that is both challenging and rewarding for our students. We continue to push the boundaries of how we implement technology in the classroom. The iPad gives us a means of tearing down the traditional walls of the classroom and make our learning environments interactive. Pope is not alone in his findings. 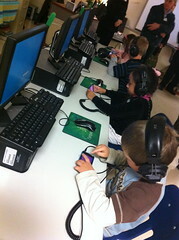 Burgess Elementary school has an interactive learning lab that uses iPods to teach phonics. Students, as young as kindergartners, show increased enthusiasm when using the devices, while students at Forestbrook Middle School use the devices in ways, that on the surface, may not seem to to tie into learning objectives. Teachers are finding unique ways to turn every opportunity into a learning experience. If you can make learning fun, students tend to pay a bit more attention. The iPad does just that. Touch, swipe and zoom your way into students minds and you find that your subject matter opens up. As schools and educators continue to tap into the power of the iPad, new areas of exploration with regards to new teaching techniques emerge. Horry County Schools are poised to be on the forefront of that exploration. To get an idea of some of the stuff that schools in Horry County are doing check out the video report below.